A window will pop up asking you to choose a team. Note that you can use the filter on the top to quickly narrow down the teams. Once you’ve found the team, click on it to proceed. In the next window, Tithe.ly ChMS takes into account the current availabilities there are for the team- as you can see, Declan Huff has a roster conflict. It’s from here you can then quickly find a replacement for Declan when the window focuses back on the volunteers area. Make sure to tick the usual settings such as Assigned Times, scheduling a notification and assigning a ‘Reports To’ person for the team. Once you click on ‘Roster Team’, the people are then placed in their respective positions in the volunteering area. 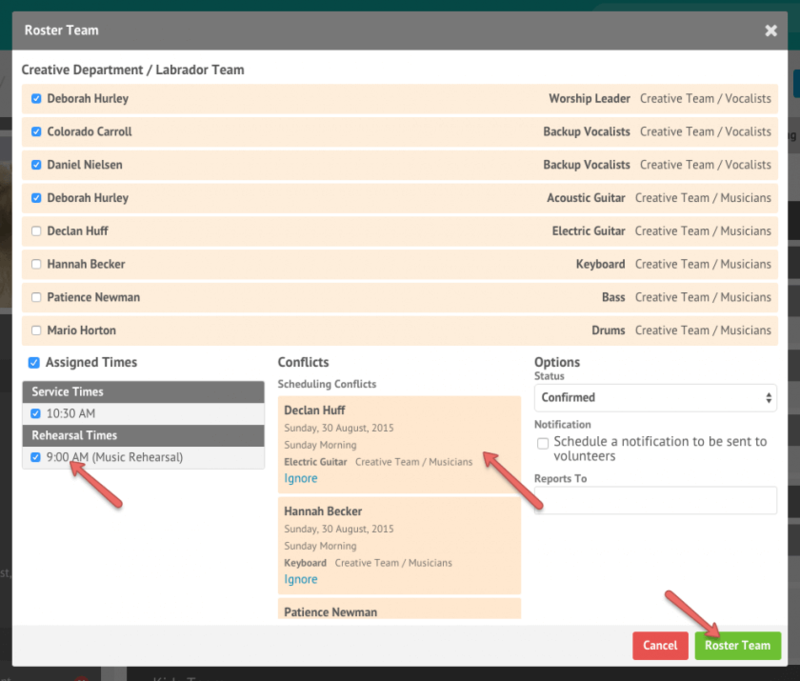 You can now fill in the gaps for any team members that were unavailable or conflicted. Any teams that are rostered will also show in the Services sidebar. As you can see, the ‘Creative Department’ service team has been scheduled for the 10:30 AM service time.